After hacking for 24 hours solo, I got Grandbox to a presentable state that I was quite proud of. 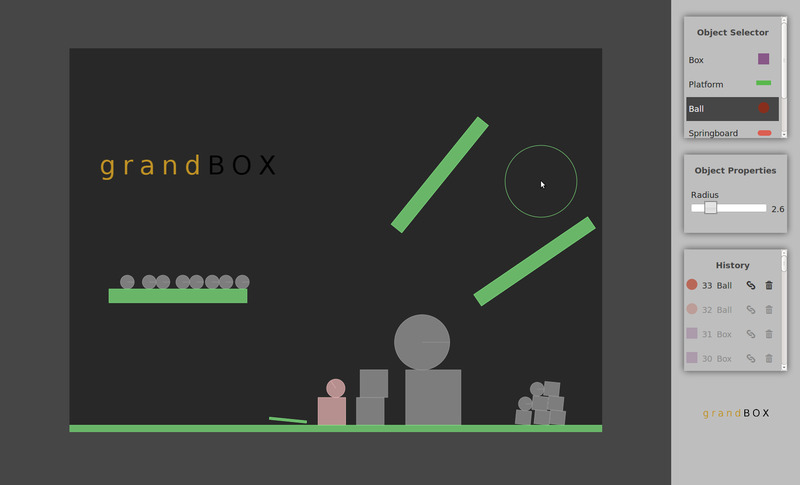 It currently has a sandbox mode where you control little pink ball that can roll around and jump. On the sidebar, there are objects that you can add to the world that interact with the player and other objects. I implemented a handful of objects such as balls, boxes, platforms, springboards, and landmines. You can jump on these objects, push them around, or stack them up. There’s the option of setting different attributes of these objects such as their size or bounciness. I was also able to work in a history widget where objects that were added can be viewed, deleted, or even binded. Binding objects together is somewhat like welding objects together, which can allow for some pretty cool stuff. I demo’ed Grandbox several times that week, once for Yahoo! and a couple times for Mozilla. Each time, I tried to make a ‘rocketship’ that would launch our little ball off-screen. I would create a little box around my ball, binding them together. On the inside, I inserted an extremely bouncy springboard on the ground. Then I dropped a ton of ‘land mines’ inside the rocketship, which applies impulse to objects it contact. So the land mines would bounce off of the springboard and hit the top of the inside of the rocketship, propelling it upwards to infinity and beyond. I only got that demo to work the first time. Clean up some collision bugs, write a JSON-serializer that serializes the object history into a string and saves the world, write a JSON-parser that parses that object history and loads the world, add more components, and write my own Canvas renderer rather than using Box2DWeb’s debug renderer. Though I kinda doubt I’ll have time to do any of that. Building this in less than a day, I think this is a good testament as to how easy and accessible it is to build for the web. Oh, and source code.